kids renaissance costumes . My daughter was determined to be a princess for the week! We couldn't go with any of the fairy tale princesses as they didn't really fit in with the the history of the Renaissance ear. These costumes that we found at Costume Super Center were perfect for the event!Where else are you going to find great costumes in the middle of the spring? Their selection is amazing and easily broken down into topics for ease of looking. I used the search engine as I knew exactly what we were looking for. One thing I love about the costumes from Costume SuperCenter is the quality. They are not your cheap, plastic style Halloween costumes that you often find at the discount store. The quality is beautiful, with care in the details. The second thing I love is the price. Costume Super Center has excellent prices for the quality of costume you receive. I have seen some of the ones at the store and you pay nearly the same price for an outfit that falls apart after one wear. Shiloh was the princess of the kingdom all week and shines like a star! 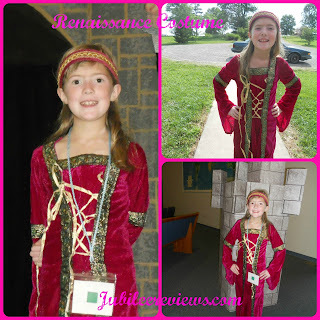 I even dressed up for the event as Lady Melanie and it was so fun sharing the experience and dressing up in Renaissance ware with my kids! Costume Super Center is consistently our source for costumes any time of the year!